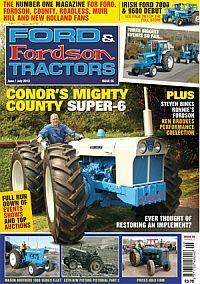 Ford & Fordson Tractors covers the early Fordsons to the last of the Fords, and the latest news with New Holland. It is also the official magazine of the Ford & Fordson Association, an active club promoting the preservation, restoration and enjoyment of these great tractors. Regular features include stories about readers’ tractors, buyers’ guides, show news, histories, tractors and parts for sale, scale models, sale reports, technical advice, news, letters and an events diary. The home of Ford & Fordson tractors. Published in English - Bi-monthly. Allow 6-10 weeks for initial delivery. The world´s most important and influential magazine brand.